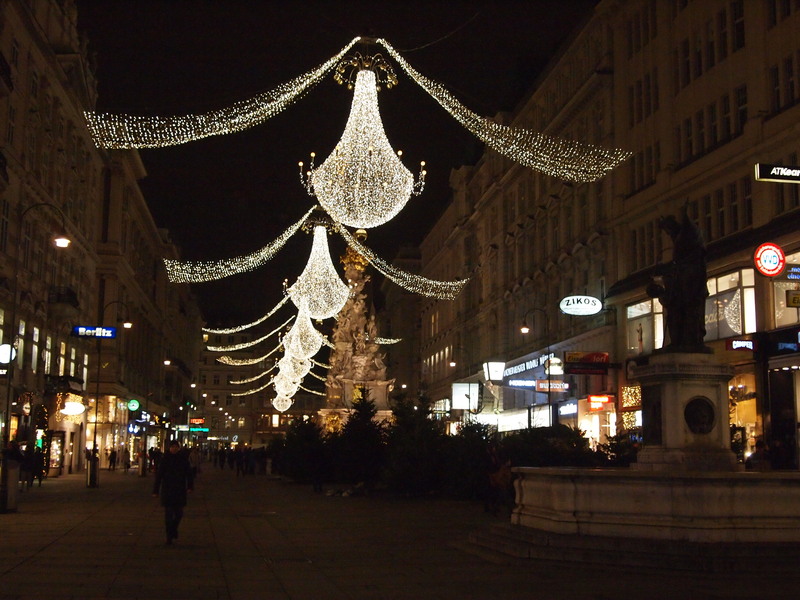 Alright, we’re in Vienna now. We got in on Wednesday night and Thomas surprised us at the train station! So we rode in to his place with him and he pointed out all the sights along the way. After we got in and put our things down we headed back out to walk around the city and grab a bite to eat. We stayed up pretty late that night and we were exhausted from our travel day and pit stop in Bratislava so we decided to sleep in the next morning. So yesterday we got a late start after sleeping in, showering, and figuring out where we wanted to go. 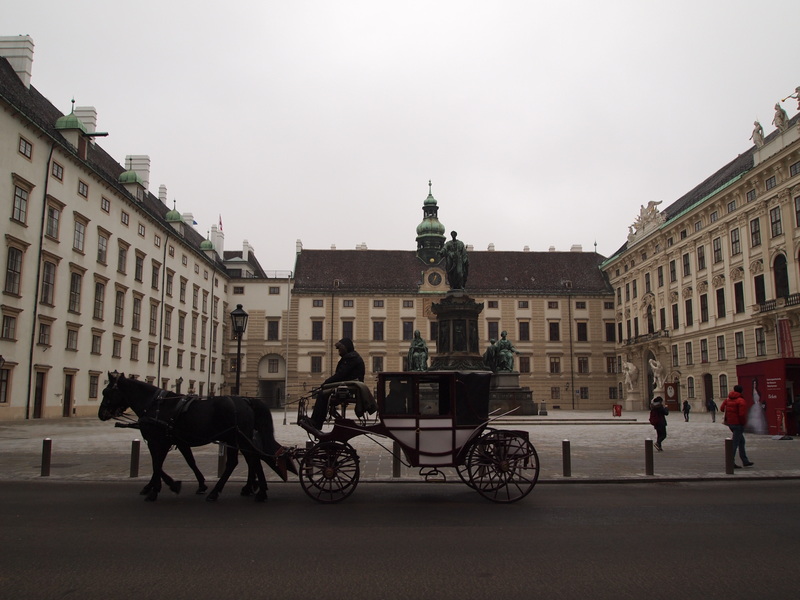 We ended up first at the Hofburg- the home of the Hapsburg dynasty for 6 centuries. 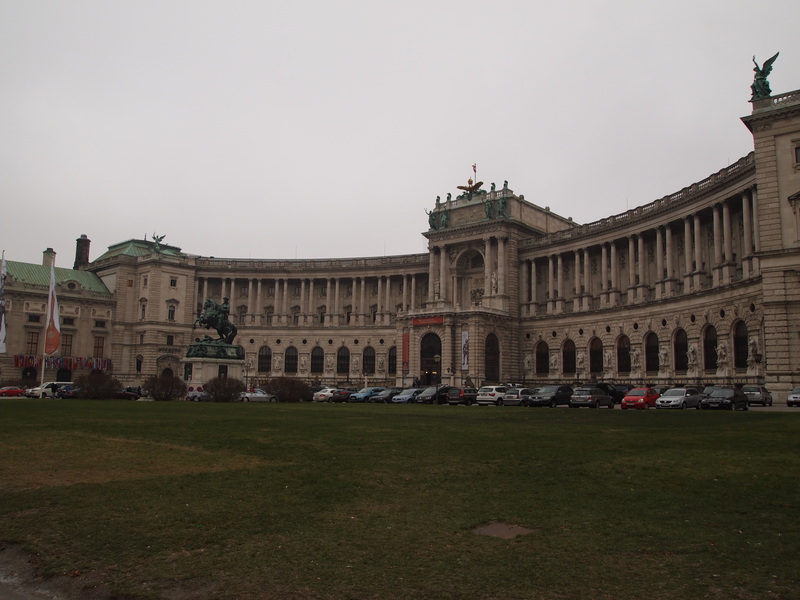 It’s a huge complex and can take a long time and multiple entrance changes to see different parts so we chose the Silberkammer (Silver Collection), Imperial Apartments, and Sisi Museum. 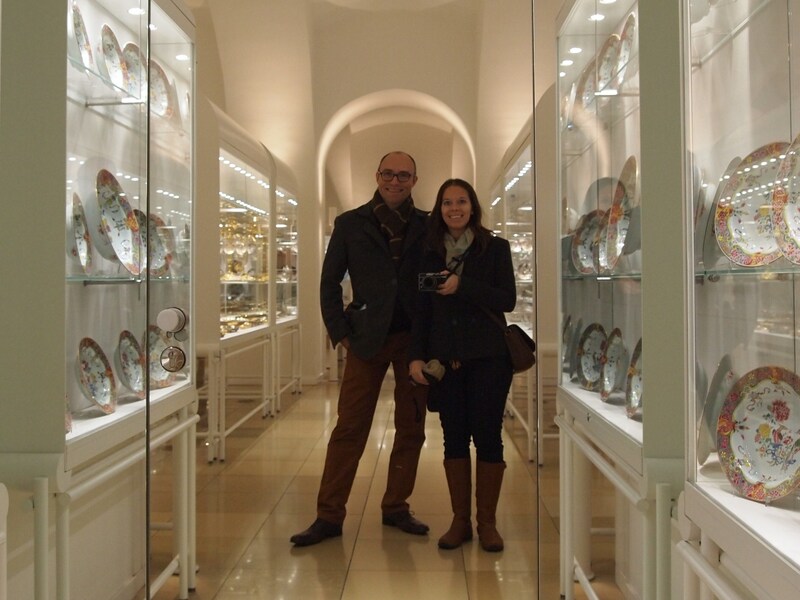 The Silberkammer is more than just silver, it’s an amazing collection of tableware in glass, silver, and porcelain used by the Hapsburgs. It was an incredibly extensive collection. Some of it is even used today for state dinners. Upstairs we learned all about Empress Elizabeth (Sisi) -her marriage to Franz Joseph, her unhappiness about being in the spotlight, and her assassination. The tour continues with a look at Franz Joseph’s study, waiting room, and audience room; Sisi’s rooms; the first bathroom; and the family room. I thought it was really interesting since I didn’t know anything about Sisi or her death and of course, it was interesting to see how they lived which was a little more simplistic than some of the palaces we’ve seen. At the same time, it was still pretty opulent. One of our favorite features was the giant ceramic stoves that most of the rooms had. They were beautiful. After standing around for so long we decided to go sit down at a café and have a coffee. 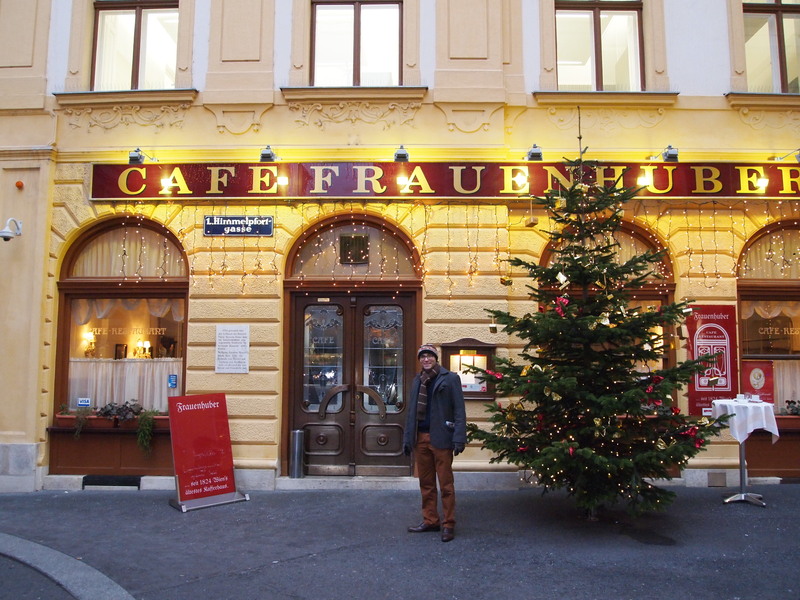 So we went to Vienna’s oldest coffee house – Frauenhuber. 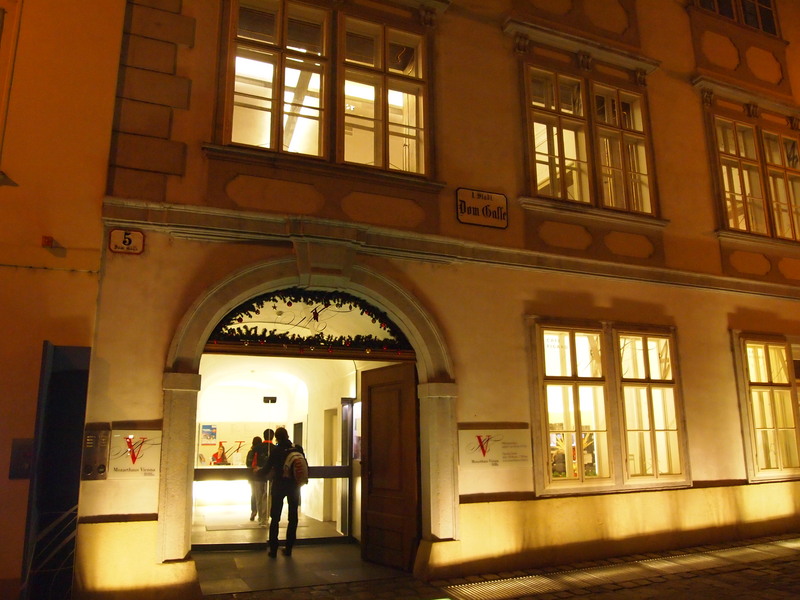 Mozart used to live in the same building and Beethoven used to perform piano sonatas in the café. 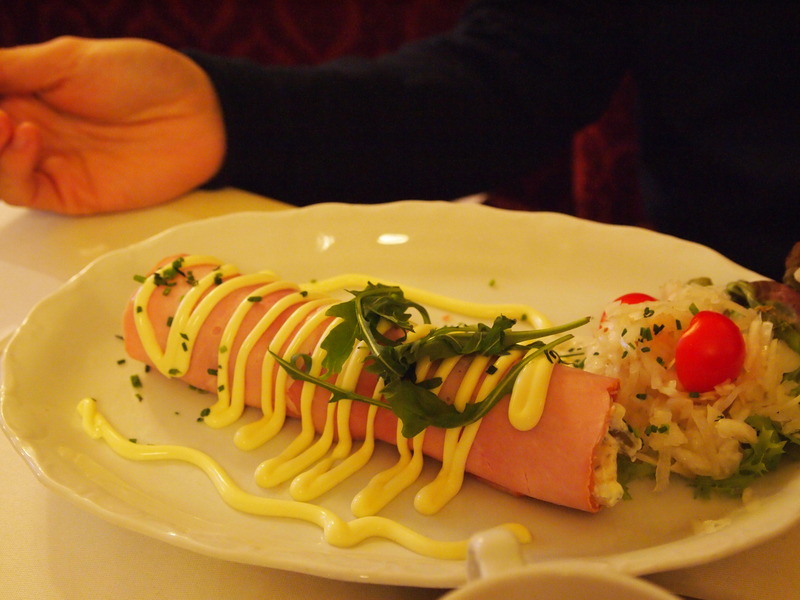 We stayed there for a little while, had some coffee, apple strudel, and a “ham roll.” We thought the ham roll would be ham inside some bread rolls, but instead it was a long, rolled up piece of ham stuffed with some type of potato salad and covered in mayonnaise. It did taste good but it certainly looked odd. It was a nice comfy coffee house. I’d love to go back and just sit and read for a while. 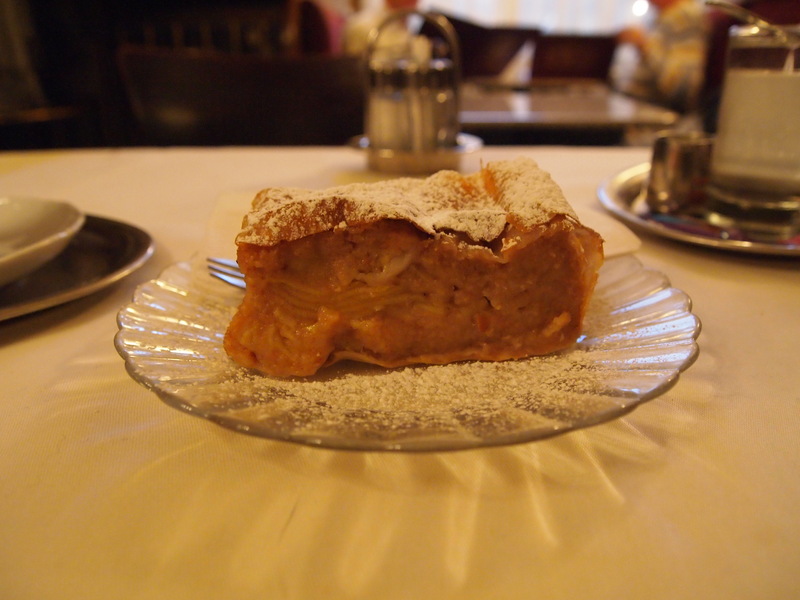 We left Frauenhuber and headed over to Mozarthaus. 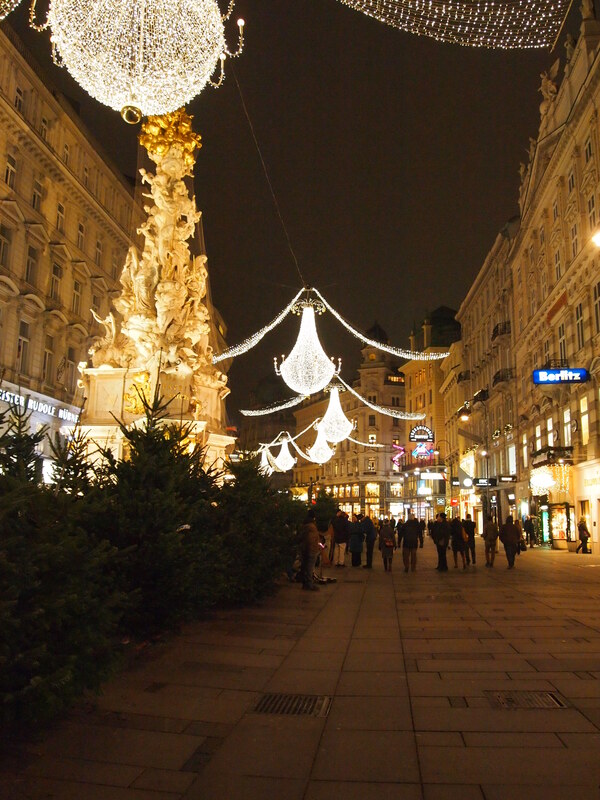 Mozart lived all over Vienna, but this location is the only building that remains. It is also where Mozart lived when he was happiest, most productive, and most affluent. The museum was really well thought-out. 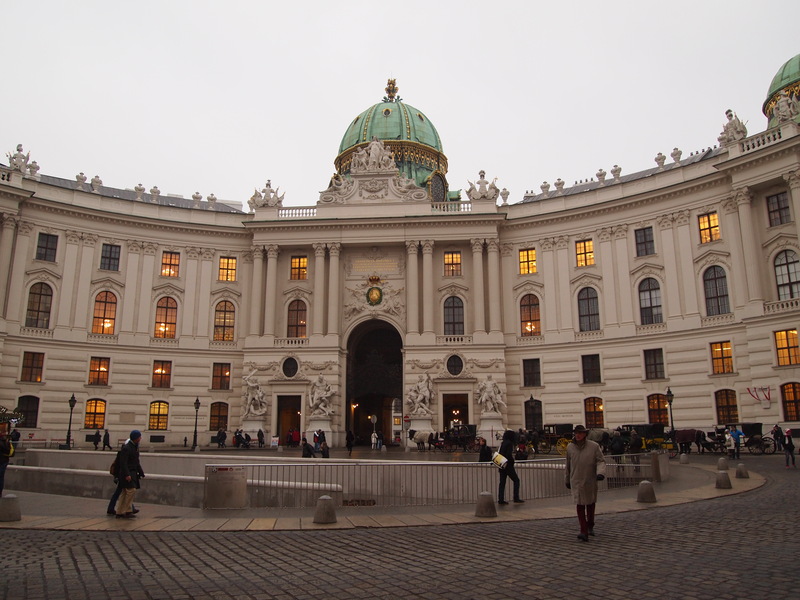 It had three levels and began by describing Vienna during Mozart’s life, then moved on to describing Mozart and his musical contemporaries, and last we walked through the rooms of his apartment where we learned about his life in those rooms. 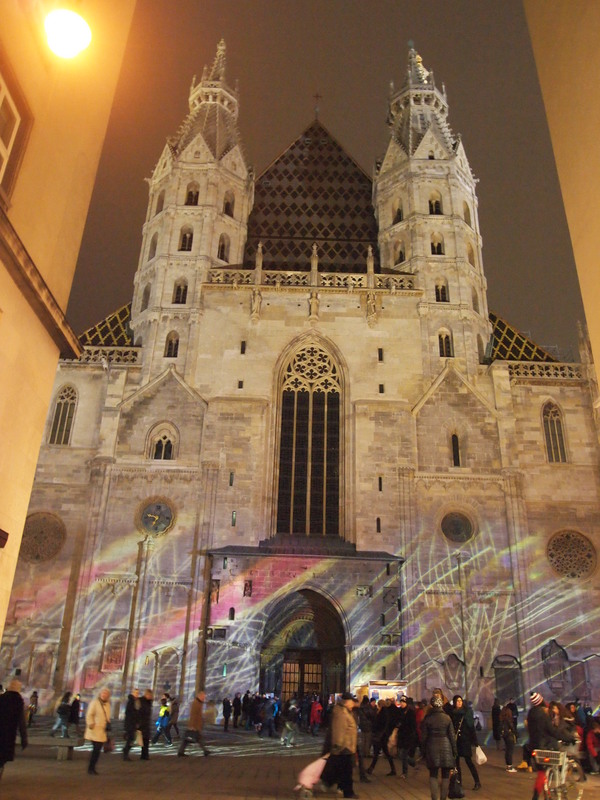 I highly recommend visiting it if you’re in Vienna and have the time. We left Mozarthaus to meet Thomas and our other former couchsurfer, Richard, and his girlfriend for schnitzel at Figlmuller. 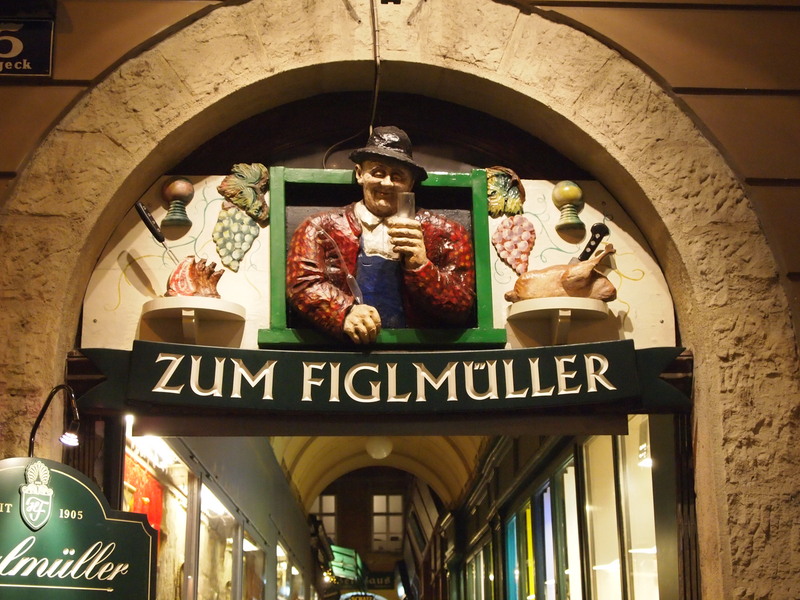 Figlmuller is a very popular tourist destination for schnitzel. 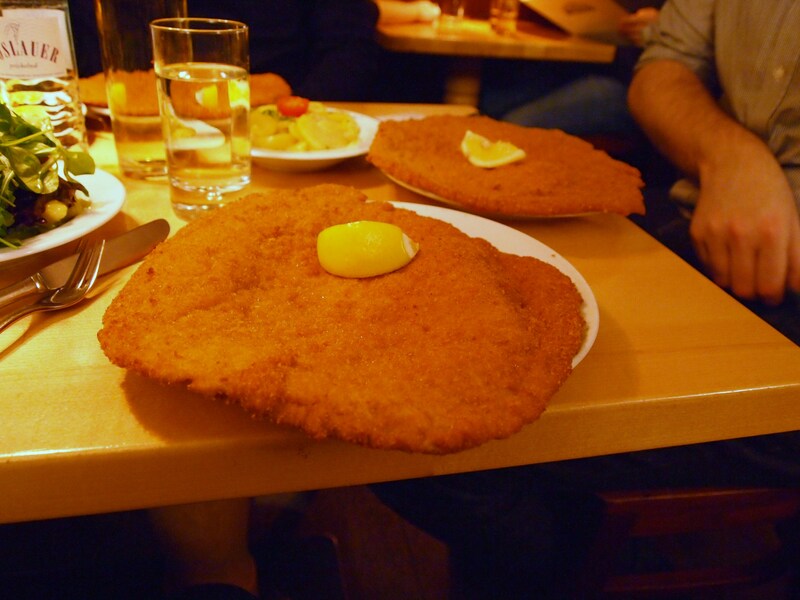 They serve schnitzel bigger than the plate! 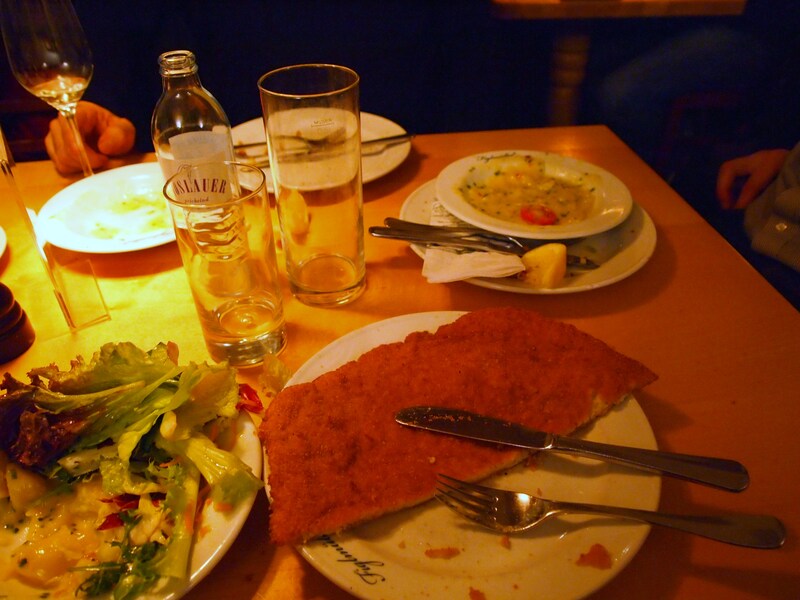 It was all very delicious, but alas, I couldn’t finish my entire schnitzel. 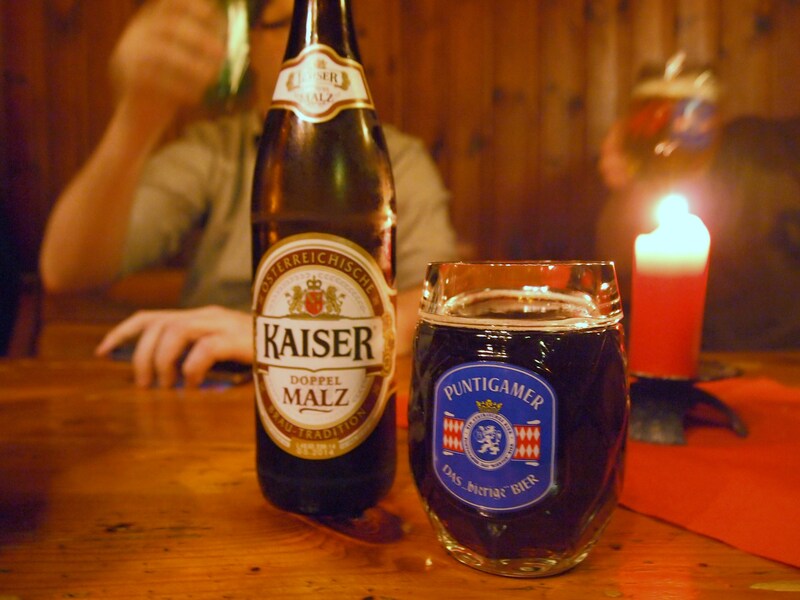 Following dinner we went for beers at Esterhazykeller which is a basement (cellar) bar. 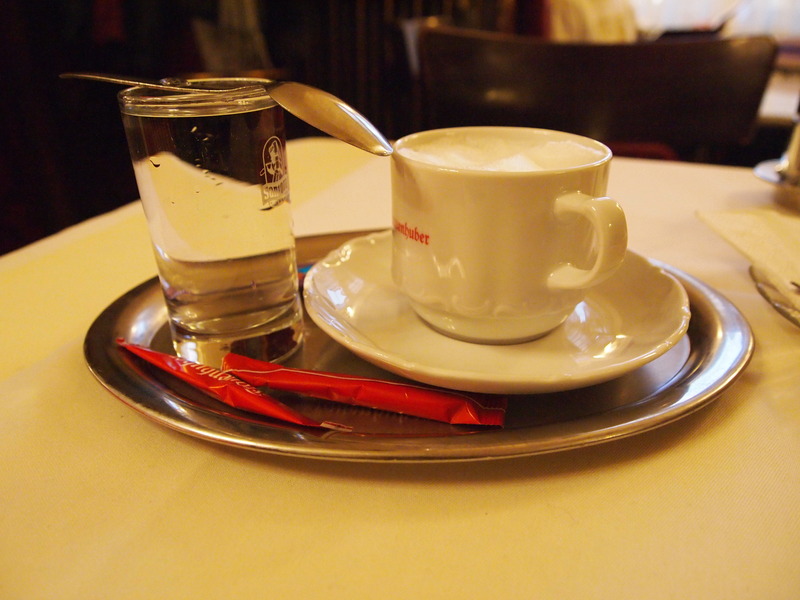 It had a great atmosphere – the table next to us was even serenaded by a pair of musicians – and the waitresses were wearing dirndls. It was a good end to the night and a great Couchsurfing reunion.